The Big Finish main range kicked off 2014 with a trilogy for the Sixth Doctor and Flip giving a welcome return for Lisa Greenwood. The stories were Antidote to Oblivion (Philip Martin), Brood of Erys (Andrew Smith) and The Scavenger (William Gallagher). How were they and did the three stories work as a set? 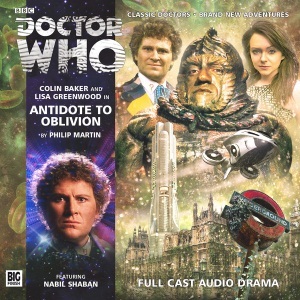 First up is Philip Martin’s tale Antidote to Oblivion: this story sees a return to London for Flip and a return of Nabil Shaban as Sil. To set some context I thought that the previous Big Finish / Philip Martin / Sil story (Lost Stories: Mission to Magnus) was poor (see: Lost Stories Series 1 reviewed); this story is much better and we see a scheming power crazed capitalist taken to the nth degree. There is also continuity back to Mindwarp, Peri and the daughter of a scientist who views the Doctor as responsible for her father’s failure. The story is atmospheric and future London works well with good secondary characters. part way through the story takes an odd direction (strange genetic experiments and intelligent micro-organisms) but overall the story hangs together. February’s instalment was Andrew Smith’s Brood of Erys which gave us an intelligent moon, an embargoed planet, a woman with no past and the cutest aliens we’ve had for a long time in the form of the Drachee. Surely this little creatures can’t have a dark side – can they? Early in the story Flip falls for the cutesiness of the Drachee and the listener just knows that letting them in the TARDIS is a mistake. This is, of course, what happens (and the scene is very well-directed by Nick Briggs and played by Lisa Gregory) and the story plays out over two discs with all the plot elements spinning and coming together like parts of a clock for the end. Not everything ends up well and the relationship between Flip and Sixie is changed by the exploration of his past companions and his attachment to the memory of Peri. The scene where the Doctor faces up to companions lost is very well done and for a moment we almost think that Susan might be coming back into the Doctor’s orbit. March concluded the trilogy with William Gallagher’s Scavenger. This is set 50 years hence and centres around the efforts of an Indian space agency to begin cleaning up the debris in Earth’s orbit. The Brits are represented by the self-serving manipulator Jessica Allaway (Kate McEwen) who is well conceived though a little one-dimensional. 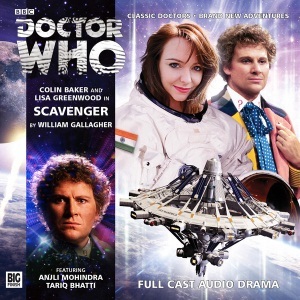 The supporting characters are a varied bunch from Salim (Tariq Bhatti) who turns out to be not who he seems and also Jyoti Cutler (Anjli Mohindra [Rani in the Sarah-Jane Adventures]) is a wonderful other player to move the story along. The plot skipped a groove somewhat mid-way through when a deeper mystery from the past took centre stage; once I’d adjusted to that I could relax and enjoy a story that moved along well, showed several sides of Flip and ended on a cliffhanger. Another great performance from Lisa Greenwood in what might be her final words. Not just made of three stories this also shone a spotlight on that most difficult of experiences in the Sixth Doctor‘s existence – the treatment of Peri in Mindwarp. Despite stories such as the wonder Peri and the Piscon Paradox there is still a sense in which Peri’s final fate is untold. The trilogy did well at bringing this thread to the fore and has been largely enjoyable. I do hope we get more of Flip and it seems wrong that the Doctor might leap straight into a search for Peri without letting us know Flip’s fate. Roll on the next trilogy! Update: as you should know by now, Flip is alive and well, married and back in the TARDIS! ← Why not contribute to the UNIT fannual? FWIW that trilogy will be “The Widow of Hurn”, “The Masters of Earth” and an unnamed episode, to be released October-December this year. 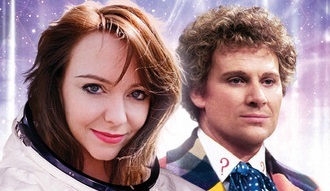 BF have announced that Peri alone will be the companion. I knew the titles and that Peri was back, I wasn’t certain that it was just Peri. I do hope that Flip gets a mention at least I don’t like to think of Sixie just abandoning her. Perils of writing I’m afraid! So, they are going to jump straight into his search for Peri, but…a two year cliff-hanger? Nothing through March 2016 indicates her return that I’ve seen. I wonder if after finding out about Peri, Peri turns the question on its head and says, “So, what happened to Flip?” And then we find out she didn’t survive. The story seems to have a bit of a contrived false choice in it, perhaps to soften the blow. Maybe I exaggerate, but it seemed that many times her choice was painted as “die a glorious death or go back to being a clerk at the local grocery”. I’m fairly certain Lisa G has been back in studio – I take it from that she has recorded new episodes set later though it wouldn’t surprise me to have her just turn up at the end of a story. I don’t see here appearing soon as the Peri trilogy already has a lot to handle. When I know more I’ll post!